Archaeologists and bioarchaeologist must articulate the intellectual merit and relevance of their work to anthropological study. Just as important (if not more so), studying the past can contribute to the betterment of humanity by investigating topics germane to modern life, such as violence, migration, and disease. In particular, bioarchaeological research documenting the frequency and causes of communicable and congenital disorders can shed light on how the human condition has changed through time. Ultimately, it can help modern epidemiologists and pathologists alleviate and prevent the spread of these disorders in our world. Today there were several articles reporting the odd rise and/or clustering of anencephaly, a birth defect, over the last three years in Washington state. According to medical records in a three-county area, 23 cases of anencephaly were documented from January 2010 to January 2013, a rate of 8.4 cases per 10,000 lives births. That rate of neural birth defects is four times higher than the national average of 2.1 cases per 10,000 live births. Epidemiologists in Washington state plan to investigate the social, physical, and habitual similarities among the anencephalic infants and their family (particularly mothers) to determine what has caused such a dramatic rise in the defect. Anencephaly is a neural tube birth defect that occurs during fetal growth when portions of the cranium and brain fail to develop. The abnormality is fatal; neonates are usually stillborn and those who survive the birth a die few weeks later. Epidemiologists and pathologists debate over the causes of the defect. Is it congenital? Genetic? Behavioral? Genetics may play a part in the development. Some epidemiologists, medical researchers, and pathologists suggest that environmental conditions (such as exposure to pesticides or an insufficient amount of folic acid in pregnant mother) may play a part. Pathologists Charlotte Roberts and Author Aufderheide suggest that westernized areas produce more anencephalic infants compared to Eastern and African groups in modern populations. Auferderheide found that the defect is more common among infants belonging to lower socio-economic backgrounds, compared to individuals of a higher economic status (see more at Congenital Anomalies website). Researchers believe that anencephaly occurred at the same rate in antiquity with the same etiology. Recovering examples of anencephaly in the archaeological record would be highly useful because bioarchaeologists can 1) investigate the physical attributes associated with neural birth defects and congenital diseases and 2) elucidate the cultural perceptions of infant mortality, life and death, and disease among ancient societies. Neural defects are not uncommon in the archaeological record, in fact, I have frequently come across a neural defect called spina bifida. Spina bifida caused by an insufficient amount of folic acid during fetal development, which inhibits the closure of the embryonic neural tube located on the dorsal portion of the sacrum. Though the defect leaves the lower portion of the spinal cord exposed (a direct hit could permanently damage the spain cord) and it may cause paralysis of the lower limbs in later life, spina bifida is not usually fatal. Due to the poor preservation of juvenile remains, particularly cranial bones, understanding anencephaly in antiquity is tricky. For starters, neonate cranial bones usually don’t preserve well because they are very thin and delicate. 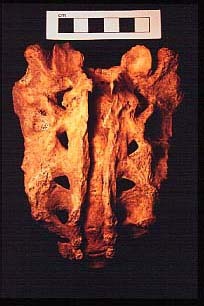 Additionally, the cranial bones have not ossified, so neonate cranial bones are frequency found in several pieces. Depending on the decaying process (or taphonomy), such as environmental conditions, the burial/tomb structure, and carnivorous actions, the recovery and processing of infant remains (let alone an infant suffering from anencephaly) is a laborious process. Investigating the burial placement and grave goods among anencephalic infants may help archaeologists infer the sociocultural perceptions surrounding life and death, visual defects, and infant mortality among ancient populations. Groups in antiquity may have considered birth defects such as anencephaly taboo, and buried those infants separate from the group’s cemetery. One of the most famous examples of anencephaly was found in the Catacombs of Hermopolis in Egypt. An anencephalic infant was found in a burial with animals, suggesting that the individual was special in some way–possibly revered. The lavishness of the burial may have served as a way for the grieving mother to overcome the traumatic loss of her infant. So how could bioarchaeological investigations of anencephaly of antiquity help us solve the increase of the neural both defect among infants in Washington state? Is it caused by low levels of folic acid during fetal development? Is there a shared behavior among those mothers in Washington counties that caused the defect? Were those anencephalic infants of European, Eastern, or African origins? Ultimately, the unexplainable rise in anencephaly has prompted medical professionals, epidemiologists, and bioarchaeologists to continue their search for the causes behind this abnormality. Has the rate increased since antiquity? Does the defect genetic? What are family’s doing now in Washington state to cause this defect, and were humans engaging in the same practice, exposed to the same chemicals, or simply passing on the same genes, that cause this defect? Research from all disciplines, a holistic approach to health, disease, life, and death, can help us elucidate the causes behind anencephaly and other fatal birth defects. Also see Matthews and Wheeler et al.